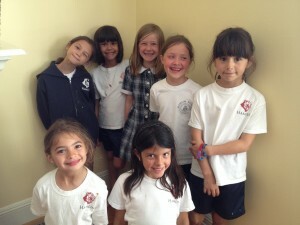 We are a team of seven second grade girls from San Francisco. During first grade, we watched the movie Ryan's Well, about a boy who saved money to build a well in Africa. This movie inspired us to build a well also. We want to build our well near a school, because we learned that without access to fresh water, education is almost impossible. Kids have to walk many miles, and miss a lot of school, and when they get there, the water isn't even clean. That means kids can get diseases and even die, because the water they are drinking is often polluted. We want to raise money to build a well so that the kids are able to have fresh water in their own communities, so they don't miss school and are educated. We hope you can help!! 09/29/14 Danielle Levine $36.00 The Levines are happy to support Alessandra and her classmates in this important cause. 08/19/14 Irene Weisman $46.00 Go Annika! Awesome project! 08/03/14 Yelena Mugin $50.00 Go Annika and Team! 07/06/14 Phyllis And Joel Silverman $100.00 I am very proud to support you and this project. 07/01/14 Enrique Lobo $20.00 Good work Alayna! 07/01/14 Veronica Lobo $50.00 'm very proud of you Alayna and all your friends! 06/27/14 Sophia Samant $10.00 i think that it is really great that you are interested in helping others. I wish I had done that when I was younger. 06/27/14 Auntie Sam and Uncle Brian $46.00 What a great cause. You are doing great work, girls. Love you, Ali! 06/26/14 Rob Twilley $46.00 Awesome job Alayna! 06/26/14 Sharon Villalobos $50.00 You girls are doing a wonderful thing for this children! Great job! 06/26/14 William Keane $150.00 Great, important project! We're proud of you. Good luck! 06/25/14 Monique Zgrblich $20.00 Great job Girls!!! We Love you Ali!!! 06/24/14 Gavin & Kelly Milner $100.00 We are so proud of you girls! Good work!!! 06/22/14 Ali, Annika & Alayna $202.65 We raised all this money at a bake sale today, and so many people were happy to support The Water Savers! 06/22/14 Laura Roche $23.00 Great work! 06/21/14 Sophia Ospina $10.00 I love to help raise money for the well. 06/20/14 Diane McDermott $23.00 YAY Ali! Go Team! YOUR Giant Fan! 06/19/14 Sue and Jerry Levine $46.00 I'm very proud of you, Ali, and what your friends are doing. Very important cause. 06/18/14 Stacey Levine $23.00 Best of luck with the campaign - great cause! 06/13/14 Ali E $46.00 I'm glad to help kids who are less fortunate than me. 06/13/14 Naomi S $10.00 I like to help people that are less-fortunate than me! 06/13/14 Laura Dwelley-Samant $10.00 I like to help people that are less-fortunate than me! 06/10/14 Alayna W-M $23.00 I'm happy to donate to this great cause to build wells in Africa!